Our aim was to study any correlation between pelvic organ prolapse quantification (POP-Q) and ultrasound measurement of prolapse in women from a normal population and to identify the method with a stronger association with prolapse symptoms. A cross-sectional study of 590 parous women responding to the Pelvic Floor Distress Inventory was carried out. They were examined using POP-Q and transperineal ultrasound, and correlation was tested using Spearman’s rank test. Numerical measurements and significant prolapse (POP-Q ≥ 2 in any compartment or bladder ≥10 mm, cervix ≥0 mm or rectal ampulla ≥15 mm below the symphysis on ultrasound) were compared in symptomatic and asymptomatic women (Mann–Whitney U and Chi-squared tests). A total of 256 women had POP-Q ≥ 2 and 209 had significant prolapse on ultrasound. The correlation (rs) between POP-Q and ultrasound was 0.69 (anterior compartment), 0.53 (middle), and 0.39 (posterior), p < 0.01. 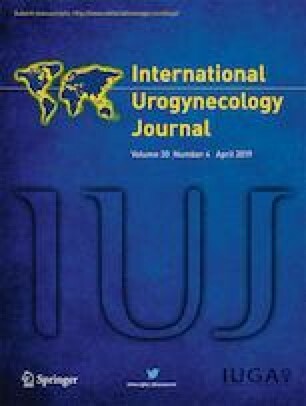 Women with a “vaginal bulge” (n = 68) had greater descent on POP-Q and ultrasound in the anterior and middle compartments than asymptomatic women, p < 0.01. For women with a symptomatic bulge, the odds ratio was 3.8 (95% CI 2.2–6.7) for POP-Q ≥ grade 2 and 2.4 (95% CI 1.4–3.9) for prolapse on ultrasound. A sensation of heaviness (n = 90) and incomplete bladder emptying (n = 4) were more weakly associated with ultrasound (p = 0.03 and 0.04), and splinting (n = 137) was associated with POP-Q Bp, p = 0.02. POP-Q and ultrasound measurement of prolapse had moderate to strong correlation in the anterior and middle compartments and weak correlation in the posterior compartment. Both methods were strongly associated with the symptom “vaginal bulge,” but POP-Q had a stronger association than ultrasound. We thank Christine Østerlie and Tuva K. Halle for help with identifying potential study participants and Guri Kolberg for help with the coordination of clinical examinations. The study was financially supported by the Norwegian Women’s Public Health Association/the Norwegian Extra Foundation for Health and Rehabilitation through Extra funds, Trondheim University Hospital, Norway, and by Desarrollo médico, Clínica Alemana de Santiago. The funders played no role in the study design; in the collection, analysis, and interpretation of data; or in the writing of the report and decision to submit the article for publication. All researchers were independent from the funders. Swift S, Woodman P, O'Boyle A, Kahn M, Valley M, Bland D, et al. Pelvic Organ Support Study (POSST): the distribution, clinical definition, and epidemiologic condition of pelvic organ support defects. Am J Obstet Gynecol. 2005;192(3):795–806. https://doi.org/10.1016/j.ajog.2004.10.602. Panman C, Wiegersma M, Kollen BJ, Berger MY, Lisman-Van Leeuwen Y, Vermeulen KM, et al. Two-year effects and cost-effectiveness of pelvic floor muscle training in mild pelvic organ prolapse: a randomised controlled trial in primary care. BJOG. 2017;124(3):511–20. https://doi.org/10.1111/1471-0528.13992. Cheung RY, Lee JH, Lee LL, Chung TK, Chan SS. Levator ani muscle avulsion is a risk factor for vaginal pessary expulsion within 1 year for pelvic organ prolapse. Ultrasound Obstet Gynecol. 2017;50(6):776–8. https://doi.org/10.1002/uog.17407.